So when my mom came to visit the other weekend I was pinning the edges of this quilt I was working on and I was cursing my dull pins and throwing them around. 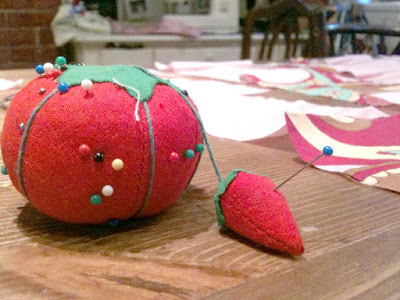 I look over and my mom is gathering the pins and sticking them into the strawberry that dangles off the tomato pin cushion that most of us use (that I had been using for the past 20 years). I said "What are you doing?" and she said "I'm sharpening your pins for you!" So apparently (I had no idea) there is sand in that little strawberry and you poke pins and needles into it and they get sharpened! Why didn't she ever give me this information before! Its great! Or maybe everyone else but me knew this and I just never questioned why there was a strawberry connected to a tomato. OMG I had no idea!! That's is the smartest little thing I didn't know ever.